Plenty of attention has been paid to pending UFAs Matt Duchene, Mark Stone and Ryan Dzingel, but another Senator is being bandied about in the rumour mill as well: Cody Ceci. 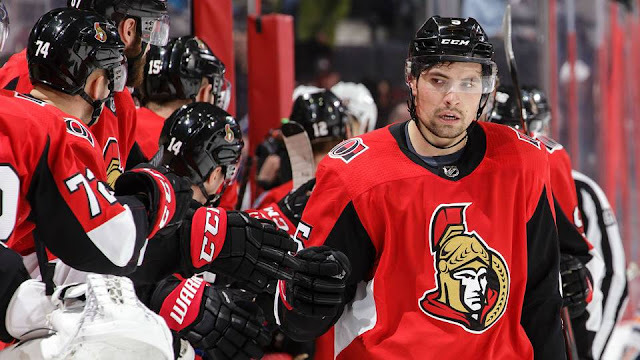 Ceci has surface in the rumour mill over the years, but with Ottawa's defensive depth taking a beating in the last few years, the idea of moving him out as well seemed far-fetched. Ceci received a 1 year arbitration settlement last summer, and is an RFA again this offseason. The Oilers and Lightning have been linked to Ceci in the past. Michael Del Zotto has struggled to stick in the Canucks lineup, and teams around the league have taken note. Rumours suggest Del Zotto could be on the move at some point before the deadline. The Canucks may not be full-blown sellers at this trade deadline, but he would certainly benefit from a change of scenery. UPDATE: Del Zotto has been traded to the Ducks for Luke Schenn. It now appears to be a virtual certainty that Sergei Bobrovsky leaves the Blue Jackets, with new reports suggesting he is unhappy in Columbus. It remains to be seen if he's moved before the trade deadline, or merely walks out the door on July 1st. GM Jarmo Kekalainen is in an unenviable position, with his fanbase likely unhappy with whatever direction he takes here. This isn't the first time I've seen his name appear in the rumour mill, but it's the first time I'm reporting it here. Timothy Liljegren, the Maple Leafs first rounder in 2017, has started appearing in rumours as some suggest he could become trade bait down the road. I didn't think much of the rumour a few months ago, but to see it out there again is interesting. I'll put him on the Trade Rumour Board at 10% for now.